January 26, 2011 by Fr. C.
It is 5 a.m. and dark. Very dark, and very cold. The temperature is about 7 degrees, and here I am. 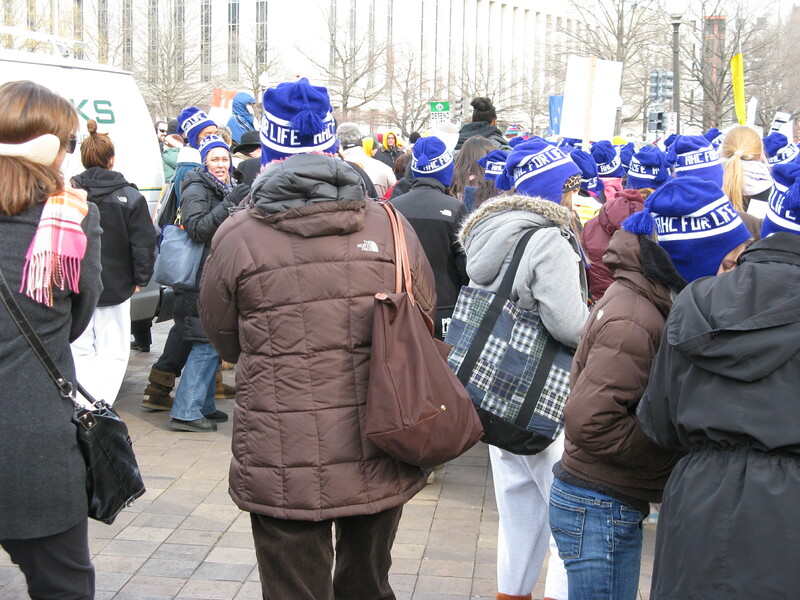 One more year and another March for Life. It is my 28th or 29th time out on this 38th March. I am tired and crabby, for I am at that age when things begin to ache when jostled about too early. This would be so much easier if folks could understand that “right to life” bit of the founding documents, and we could be having a nice Mass of thanksgiving to celebrate our children–say at noon on a Sunday in June. But, here we are still marching and praying for culture of life to return to our nation in the face of an executive branch committed to “choice” and a health care proposal that seems as much a threat to the elderly as to the unborn. In the first dark hours of the day, I pray that my daughter, born on the anniversary of Roe v. Wade, will not have to be marching for life in her adult years. It is she with whom I will be marching, along with her 11th grade classmates from the Holy Cross Academy. My coffee is cold even before I can get out of the drive, and we head to school mostly in silence. After an assignment of the girls in our group, we head out into the dark, 100 strong, to take the Metro to the Youth Rally and Mass at the Verizon Center downtown. I am glad of my wool cassock and my purple “AHC” wooly cap (not recommended for liturgical use) , as I contemplate the cold, images of which I began to pray over on a packed train-the cold of instruments, the cold of life torn away from the womb, the coldness of the hearts that permit and endorse such things. The cold passes away as we herd our group into front-and-center seats for the Youth Rally and Mass. We can see everything from our vantage point, and certainly hear the mostly deafening music. It is worship and praise of the loud kind, but the people pouring in are responding–waiving hands, dancing, praying aloud. I feel more like hearing a requiem, but, I guess I am of an age. The rock concert momentum of the event seems an odd juxtaposition to the gravity of the day. 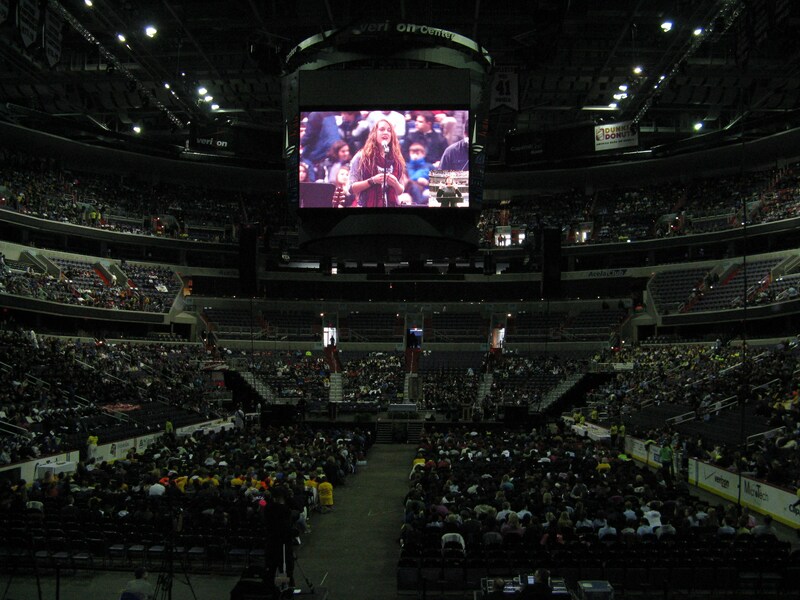 “Youth ministries” know best, I guess, and there is full multi-media on the big screen of the arena with various groups of young pilgrims getting face time in full color. Then it is time for Mass-a Mass for 20,000, with another going for 10,000 over at the Armory. There is a procession, seemingly endless with deacons, then priests, then bishops, archbishops and even a couple of cardinals. The celebrant is Cardinal Wuerl of the Archdiocese of DC, and the homilist a young priest who brought home the gravity of the situation. Then quiet in so large a crowd as 20,000 rose to receive the Sacrament (and an occasional blessing) from the hands of the clergy. No lay administration here. Amazing the effect of the Presence of Christ on so large a crowd. 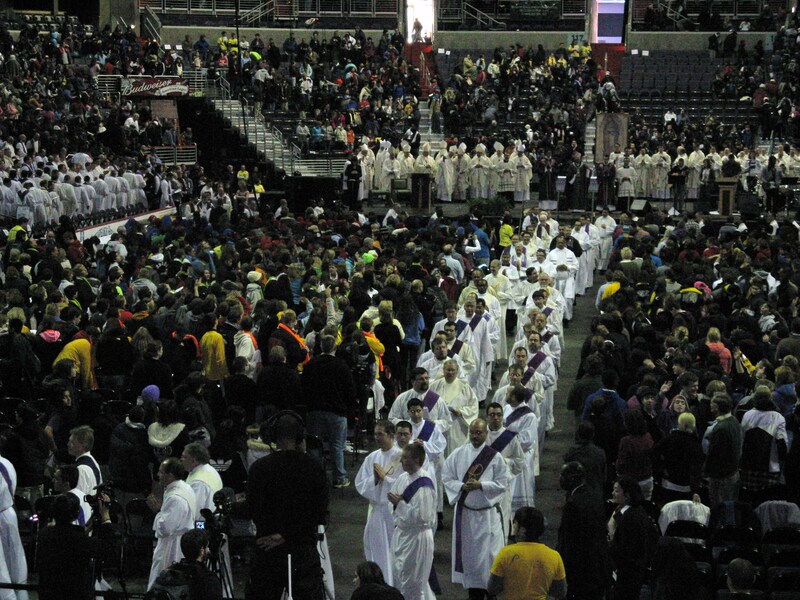 Then, back to the fire up–the hundreds of priests are introduced to the rock star roar. Then deacons, and religious. The crowd is standing and applauding each order. Finally, the seminarians over on the Epistle side (I think it was the Epistle, but, facing altars flummox me). A roar louder than all. But then, those feeling a call to vocation are asked to stand. Haltingly, young people in the hundreds rise up. More thunder from the crowd for those who may be tomorrow’s leaders in the Roman church. I took a moment to pray that we’d see such a desire on the part of our Anglican Catholic young people–men under the age of grey entering the priesthood and young women restoring our Anglican religious life. Now its out to the street and utter confusion. The route is less than half of its old track from up near the White House. I guess we had to be kept at a stand off distance unless the chants of, “Hey, Mr. President, your mother chose life!” might touch a conscience. Police vehicles, too, broke the pattern of the march, positioned in the route itself, as a barricade for what? Somehow, the march began with the official starting groups somewhere in back of us. The short route and jumble made sustained prayer impossible. My daughter, now seventeen, walked alongside as we walked up Capitol Hill and on the the Supreme Court. Over the years, I have walked alone, with other clergy and in parish groups. I have never had better company than Laura, who kept me focused on the surge of young people, the prayers and, above-all, the placards-graphic placards-that depict some of the cost of abortion. It was my teenager’s comments that let me know that there will be faithful Christians following in our steps to carry the Cross on behalf of all human beings. That’s hope…real hope. Then, suddenly, it is over all too soon. A quick prayer before the Supreme Court, and back down the Hill to Union Station. We encounter some of the disdainful–sneering government staffers who push past, but, thankfully remain silent. These are they who write bills which go unread by their purported makers-the bills that encourage “rationing” of care to the elderly, fund abortions and enshrine that which was once called sin in law. I know the look-I worked here for many years in a part of life now very distant. I am glad of my parish home in Richmond. We board the Metro back to the school. Things are subdued. Some of our group fall asleep. No one bothers us or stirs a debate as used to happen on this day. 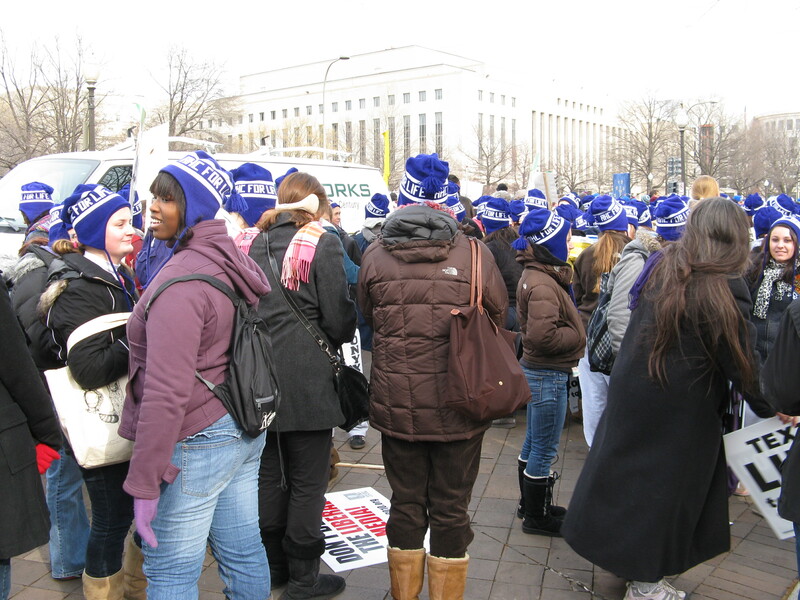 On the walk from our stop, it is the parents who are talking–many had not been to a March for Life. Some who had, had not been for years. There was a sense of renewal, and profound gratitude for the gift of our own children. And so it was that I ended up asleep a little after 7 p.m., tired and cold. At midnight I woke, and spent some time staring into the night contemplating all of the walks I had taken, and all of the lives cut short over those years–the potential of God’s children lost. So, I will keep walking and praying until there is a change or I can walk no more, but safe in the knowledge that there are those who will take my place.